For decades, all businesses in different industries relied on paper to perform their daily operations- from back-office functions such as finance to front-end operations of marketing and advertising. This approach, however, has resulted in tons and tons of paper usage each year- which just either go in the storage room, or in the trash bin. According to statistics, the paper usage in the past 20 years has increased from 92 million tons to 208 million, which is a growth of 128%. This increase in paper usage, and the continued reliance on this approach, however, has some obvious impact on the environment and on the operational efficiency of the business. Although many companies throughout the world have already started to take the paperless approach in their business, they have been met with a lot of obstacles that hinders their progress in this area. These obstacles include a historical and intense reliance on paper by the organization, lack of clear roadmap of what needs to be done to fully implement the paperless approach, and insufficient knowledge on technology that can reduce or replace paper in the office. Despite these challenges, there are industries today that have been using the paperless approach in their operations in the past years. The legal industry, in particular, has already adopted new techniques and tools to further improve their client satisfaction, as well as to streamline their practice. More and more law courts today are embracing new technologies such as eTrials and eBriefs to improve the whole litigation process and increase the transparency of the justice system as a whole. These also helps legal firms to offer premium service to their clients by providing quick access to important documents in court, real-time access to relevant documents for persons involved but cannot go in the court personally, and a significant reduction in paper management and photocopying. Aside from legal firms and courts, other industries and organizations have already implemented new systems in their operations to cut off cost and inefficiencies that come with the paper approach. Field services companies, for instance, have been using field service management software to issue an invoice to their clients and track their inventory real-time without using a single piece of paper. This shift from paper to digital tools is expected to continue in the years to come, thanks to the advent of technology. From increased profits to improve productivity and sustainable working environment, going paperless is certainly the trend that no business can afford to ignore nowadays. 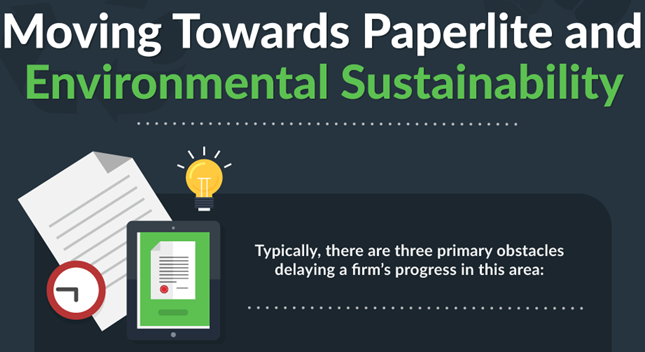 Check this infographic developed and provided by "Law In Order" and learn how your business can adopt the paperlite approach today.